Here is one my pots from 2009 that was potted up with an Escambron, a deciduous tropical tree. In my opinion, this pot was a good choice in regards to its style, color, size and shape. As a bonsai potter, it is always a thrill to open up your kiln and see your finished pieces. Sometimes you are happy with expected results, sometimes happy with unexpected results, but there is always a joy or element of surprise. When I opened the BSF magazine this week I was met with another surprise, seeing such a beautiful subject in one of my old pots. The owner is a great designer and his work is evident here. The tree has a greyish cast in its trunk that I feel helps to unify the subject to its container. 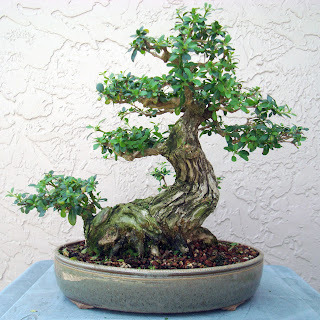 The style of the tree, with its feminine curve is well matched to the pot: both are predominantly feminine, but the depth of the container and the girth of the trunk work very well also. After all, both feminine and masculine features usually are present together in bonsai compositions, but good compositions have a balance. They are usually predominantly feminine OR masculine, with smaller qualities of the other. I am alway overjoyed when I see one of my pots under a beautiful tree especially when both tree and pot are paired so well. This is no exception. Go Mike!